I generally eat lunch alone. As an introvert, the pressure of so many students' emotions bouncing off me all day can be overwhelming. I love to know them - to understand their joys and delights, their frustrations and sadness. I want to support them. Yet sometimes it feels like more than I can handle. That's why I almost never seek the group when lunch time rolls around. I'm sure I've lost some chances to be part of the cool teacher gang at more than one school because of it. But I just seem to need ten minutes of reading The New York Times or watching Netflix as I eat my lunch. Ten minutes when I don't need to read anyone's emotions and try to figure out how I could be helping. Do you ever feel this way? Like you need a few minutes to be yourself alone? Though most of my students are not facing extreme poverty or danger, they have their own hardships. I once had parents drop off an advisee of mine with an obvious and extreme eating disorder to the dorm, saying to me "just make sure you're checking that she eats." I sat in a room with an advisee's mother who lived several states away from our boarding school. "We're getting divorced," she said to me. "But we're not telling her yet, OK?" I've checked in students for lights out who were obviously crying in bed and listened as students shared their fear that a friend might take her own life. Sometimes I don’t know what to say. Sometimes I wonder why anyone thinks my degrees in English literature have prepared me to help students with these things. Sometimes I almost wish I had a nice safe job climbing a corporate ladder somewhere. But I want to help these kids. Several years ago my husband attended The Stanley King Counseling Institute, where he spent several days in intensive role plays, discussions and presentations to learn how to listen and counsel students. As the dean of dormitories at our school, he frequently finds himself listening to students who are upset and in crisis. I asked him what his biggest takeaway from the institute was. It turns out to be a pretty doable, actionable step we can all take. "When a student is going through something, being a teacher doesn't mean you have to fix it. Sometimes it just means you have to give them space to express it." Wait a minute, don't try to fix it? Really? Just listen? The video below is the best illustration I've ever seen of this concept, which is so easy to agree to in theory and SO HARD to put into practice. 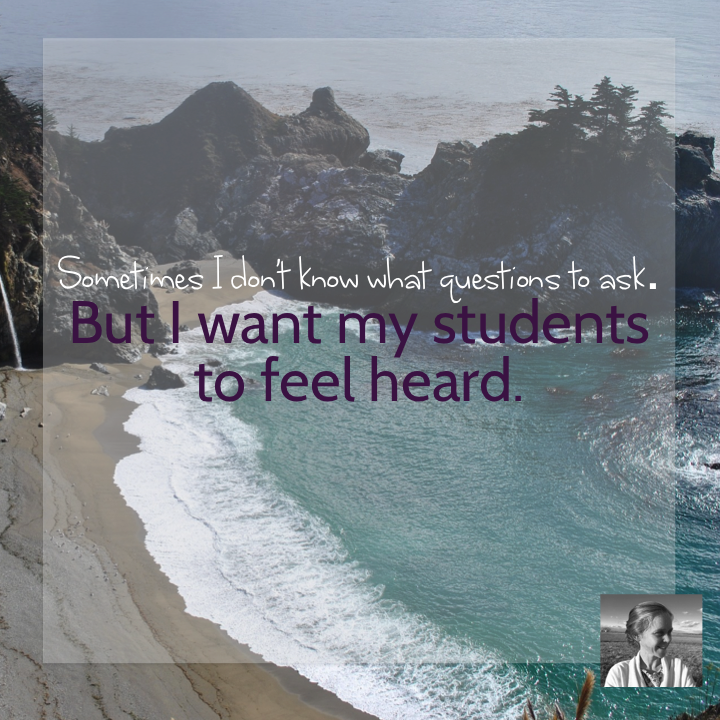 Although it’s difficult for me at times, I WANT to listen to my students and give them a way to be heard and understood. Though I might not be able to solve their problems, if I can remember that listening is it's own gift, that can strengthen me to hear. All it takes is a moment to get started. "You seem sad this week. Is anything bothering you?" "I noticed you were awfully quiet in class. Are you OK?" "I know some big things have been happening in your life lately. Do you want to talk at all?" "If you feel like talking about anything, I'm here." But sometimes that moment can be hard to find. That's why this month I made a downloadable poster you can put up in your classroom to invite students to bring things up with you. Just print it and put it up next to a stack of stationary and a drop box. 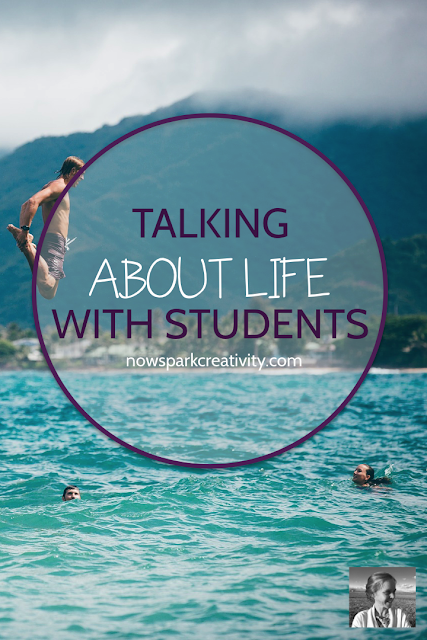 Give students a chance to open a conversation even on the overwhelming days, when there is no time to find a quiet place to talk. 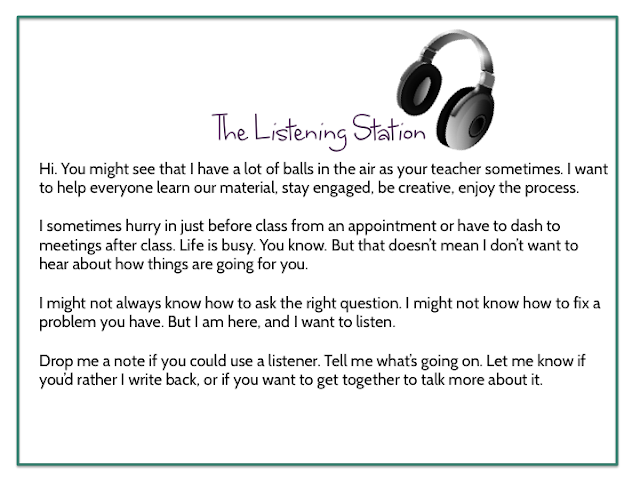 You can make a permanent statement to your students that you want to hear what they have to say, just by putting this up. 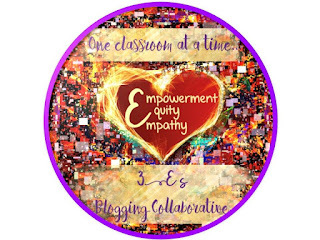 This post is part of The 3Es Collaborative Series that comes on the last weekend of every month. I'm proud to join with a group of educators who care about promoting the values of empathy, equity and empowerment in our schools. You can check out all the posts from this month's collaboration by following the links below. You can also follow the collaboration on Facebook right here. Our mission is to foster equity, empathy and empowerment in classrooms around the world. 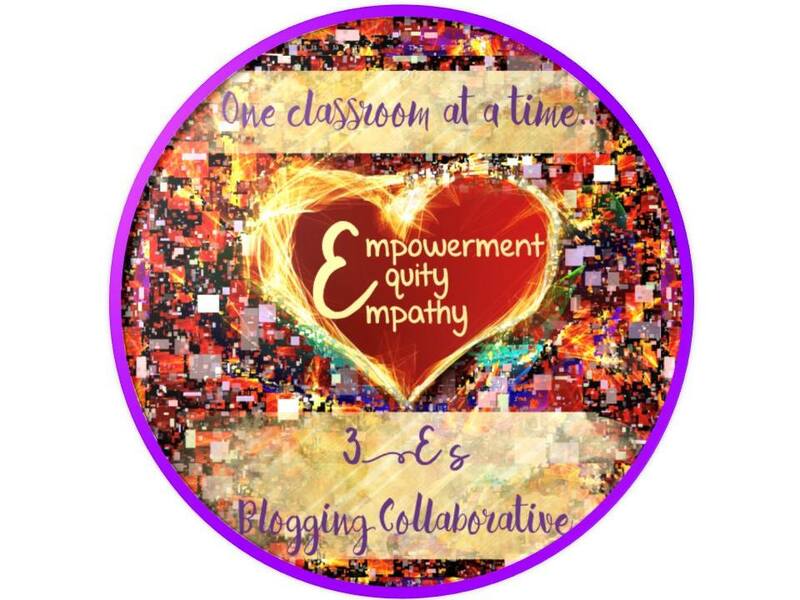 On the last weekend of each month, we share ideas for developing the 3 E's in your classroom and school community. Our goal is to make it easier for you to include these values in your every day teaching by offering ideas and free materials to support your teaching endeavors. Now, more than ever, nurturing EQUITY, EMPATHY & student EMPOWERMENT is crucial for all our students.